For Ann Kennedy, the “aha” moment didn’t come in a lab, but rather on an early spring day some 25 years ago in a field in Pullman, Washington. The USDA Agricultural Research Service soil scientist was walking through a pasture near her house, when she noticed something. Or rather she didn’t. The mat of bright green cheatgrass shoots that once dominated the land come spring were nowhere to be seen. Instead, native plants and grasses like Idaho fescue and bluebunch wheatgrass had sprouted. It was then Kennedy remembered she had applied part of a bacterial experiment on the land a few years prior. Clearly, something was working. 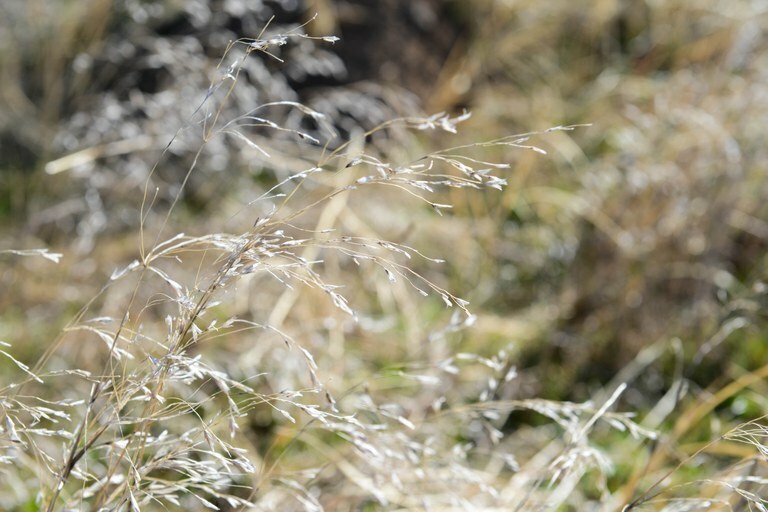 Cheatgrass, sometimes called downy brome, is one of the most invasive weeds in North America. Since it was introduced via Eurasian grain imports in the 1800s, cheatgrass has put down roots in every single state, and has become the dominant plant on more than 154,000 square miles of the West. The invasive weed not only sprouts early, “cheating” native plants out of early spring water and nutrients, it thrives on disturbance like roadside construction, livestock grazing, and most of all, fire. The fire feedback cycle associated with the weed has transformed the American West, turning shrub steppe into grassland. Cheatgrass carries fire easily in regions like the Great Basin, where it allows flames to travel from shrub to shrub, recovering easily after such intense heat. And when that yellowish-gray cheatgrass dries out before peak fire season, it leaves a perfect fuel bed behind. Studies have shown that fire occurs four times as frequently in cheatgrass landscapes than in all other types of groundcover combined in the West. Researchers have been desperately looking for a way to overthrow cheatgrass’s reign for decades, and have tried some wacky experiments in the process — from fungal pathogens like the macabre Black Fingers of Death to changing soil texture to introducing super absorbent polymers into the ground to soak up water. Now, after nearly 30 years of trials and research, Ann Kennedy has found the innocuous cure — native soil bacteria. In 1986, Kennedy was investigating the poor growth of winter wheat in Whitman County in eastern Washington when she stumbled across a bacteria, Pseudomonas fluorescens, that seemed to be inhibiting the number of shoots. She wondered if the same idea could be applied to weeds, like cheatgrass, medusahead, and jointed goatgrass. After testing 25,000 types of bacteria from nearby fields, and ensuring they didn’t negatively impact native grasses or other animals, Kennedy eventually settled on two weed-suppressive strains, later dubbed D7 and ACK55. Within three years of a single application, the bacteria reduced the amount of cheatgrass in test plots by half. Another five years, and it was down to almost zero. D7 was later sold off to a private company, but ultimately was less selective than ACK55. In addition to inhibiting cheatgrass, medusahead and jointed goatgrass, D7 also stunted the growth of native species like Sandberg bluegrass. ACK55 is now undergoing the EPA registration process, which is expected to take roughly 17 months. Then it will be available for widespread use. For Michael Gregg, a land management biologist with the U.S. Fish and Wildlife Service in Washington, there’s no question of whether or not ACK55 will work. It’s more of a question of application and whether it can be used across a large enough area. ACK55 can be applied two ways — native seeds can be coated in the bacteria during restoration efforts or it can be sprayed on the soil surface. “A lot of things have to go right,” he explains. “Mainly, you have to get the bacteria into the soil in the fall to colonize over winter and get to the cheatgrass roots in the spring.” In order to ensure the bacteria makes it in, you need precipitation within two weeks of application — and colder temperatures. ACK55 doesn’t like sustained heat. Then there’s the matter of size. Cheatgrass dominates some 25 million acres in the Great Basin. Spraying such a vast area is prohibitively expensive, so researchers like Kennedy and Gregg advocate for a focused application. The reactive approach is to apply the bacteria in recently burned areas to prevent cheatgrass from colonizing the landscape. The proactive step is to treat the leading edge of infestations — areas where cheatgrass is fast approaching. Even then, the bacteria needs to be used in concert with other management tools, Kennedy says. For example, the bacteria can’t simply be applied to monocultures of cheatgrass, as eventually the weed will just regenerate. The best regimen, she says, is to apply herbicides that attack cheatgrass at the surface level, while also applying ACK55, which attacks seedlings and the long-lasting seed bank underground. Then reseed with natives. Ultimately, we could one day see the Great Basin region restored — which is critical for the sagebrush-dependent species like sage grouse that have seen their habitat converted to grassland. But it’s a slow process. As ACK55 takes its final test (via the EPA registration process), Ann Kennedy is already eyeing her next project — the invasive Italian Rye that’s taken over her neighbors’ land in Pullman.